From special occasion to just for fun, vintage rings offer time-tested style from the past. These fashionable choices demonstrate that while �there�s nothing new under the sun,� old styles can look just as striking in the present as they did years ago. In gold, platinum or silver, vintage rings are both timeless and timely. Read more. Vintage gemstone rings are available in a wide selection of styles featuring both precious and semi-precious stones. From classic gems like rubies and emeralds to more unique options like smoky quartz and blue topaz, there�s a vintage ring with a stone for every taste and personality. Pick one that catches your eye or one that holds special significance, such as your birthstone or a gemstone that makes you think of a loved one. A number of vintage rings combine the �forever� qualities of a diamond with styles that have proven that they have staying power. Apples of Gold�s vintage diamond rings are cast from authentic molds from Victorian era, making them genuine styles from this period. Bold Art-Deco inspired styles, antique engraved designs and intricate filigree are all prove to be fitting partners for the stone that�s renowned for its lasting strength and beauty. Vintage diamond rings make excellent engagement rings, and can show the woman you want to spend the rest of your life with that your love for her isn�t just a passing trend. These vintage rings have and will stand the test of time, and represent a love that will remain. Vintage bridal sets seamlessly combine a vintage engagement ring with a matching wedding band for a perfectly coordinated look. By choosing a vintage wedding band, as part of a set or on its own, you add an additional sense of lasting commitment to the wedding ring ceremony. In addition to the concept of eternity symbolized by every wedding band, vintage bands represent a commitment to one another than won�t go out of style. Silver vintage rings are the perfect way to get time-honored style without breaking the bank. 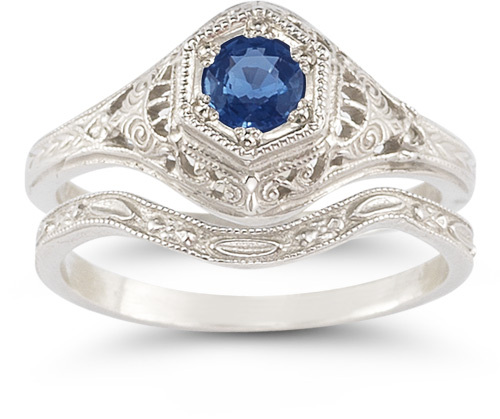 Apples of Gold�s silver vintage ring collection includes Victorian and Art-Deco style rings, wedding bands and bridal sets, as well as the same variety of gemstones found in our gold rings. Made of the highest quality sterling silver, there�s a silver vintage ring for tastes ranging from feminine and frilly to big and bold. Apples of Gold�s vintage rings aren�t just a blast from the past. They�re destined to become the heirlooms of tomorrow.